Local Foods Connection's mission is to enhance the Grinnell area food system by making it more accessible to families and individuals with limited means. We aim to increase the opportunities for all community members to enjoy fresh, healthy food, connect with local farmers, and expand their skills and knowledge of cooking and nutrition. B&B Farms has been selling meat locally for over 30 years. We raise beef, pork, lamb and chicken. In addition, we raise the crops we feed to these animals. What we don't do: We do not use GMO seed, nor do we use herbicides, pesticides, or fungicides on the crops. We do not use growth hormones. What we do do: All of our animals have access to the outside, and whenever possible are on pasture. Our focus is on regenerating the soil, restoring native habitat, and honoring the animal nature of the livestock we raise. You can order meat by calling Suzanne: 641-990-8643, or Barney: 641-990-7843. You are also welcome to come and get a tour of our farm and meet our animals. Compass Plant CSA has been serving the Grinnell area for 18 years. From the corner of 16th and Penrose, and on our acerage in Sheridan township, Ann Brau and Lisle Dunham provide over 40 different vegetables, pork, chicken, turkey, and eggs for our customers. We grow our food without chemical inputs and use mulch, compost, and our animal manures to fertilize and nourish our farm. Pest control is managed with rotations, intercropping, variety selection and mechanical barriers. We serve our customers with Compass Plant CSA which provides food from May to December for shareholders, the Grinnell Farmers Market, and Grinnell Local Food Source. G&S Farms is locally ran by Gary and Sandy Durr. Sandy Durr sources her eggs to a local feed store, and sells them at the Grinnell Farmer's Market. Customers also go to the farm to get eggs. Sandy’s chickens are fed a mix of corn, hay, oats, sunflower seeds and greens. Her “girls” as she calls them are antibiotic and cage-free. When visiting Sandy and her girls, it is clear she has a deep passion and love for the welfare of her animals. If you stop by the market for G&S’s eggs, you will also find Sandy’s, “Pure & Natural Handcrafted Soaps”, which she sells through her company, Soaring Creations. We are excited to welcome Sandy as one of Local Foods Connection’s egg distributors! Grinnell Heritage Farm dates back many years, as the name suggests. In the present day, the Farm owned and operated by Andy and Melissa Dunham. Grinnell Heritage Farm is certified organic by MOSA and annually reviews and improves its regenerative farming practices. The farm supplies food to the local community through their CSA program, to select grocery stores, and at local farmers' markets. Andy Dunham became interested in farming during his time as a Peace Corps Volunteer in Tanzania. While living abroad he realized how much there was to learn about sustainable agriculture and decided to pursue his career state-side by starting a farming business focusing on environmental well-being. Grinnell Heritage Farm enjoys bringing the community together and passing along information about nutrition, sustainability awareness, and environmental issues. When talking to Andy about Local Foods Connection, he stated that he is most excited to spread the word about how tasty local-and-nutritious food can be. The Olson Garden Market is a family operation that began in 2010 with a surplus of green beans from their family garden. Kerri jokingly asked if there was somewhere they could sell them. Her husband, Brian replied “at the farmer’s market”. 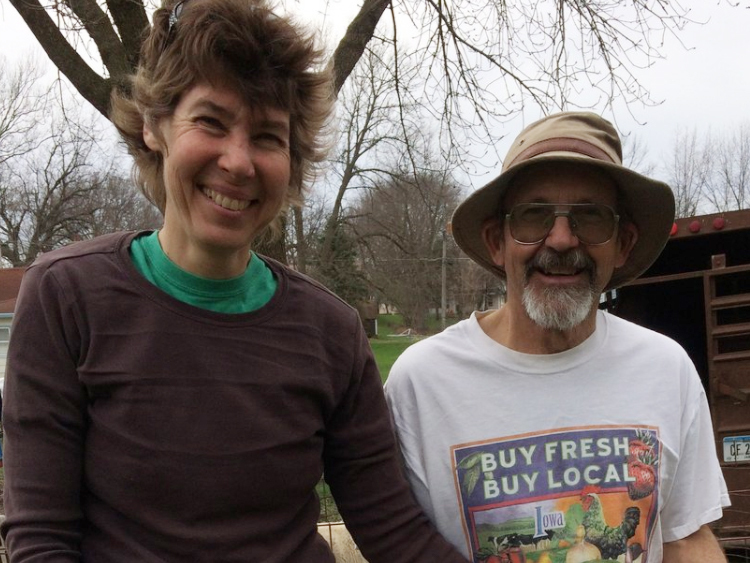 The next year the Olson’s started Olson Garden Market and began attending the Grinnell Farmer's Market. Now, the Olson’s farm has 1300 tomato plants with over 30 varieties of unique heirloom, cherry and the basic red tomatoes. They also grow a variety of other vegetables that include but are not limited to asparagus, candy onions, summer squash, beans, cucumbers, and eggplant. Over the past 7 years the Olson Garden Market has expanded their garden to meet the demand of customers and the local community. Kerri keeps her followers up to date through the Olson Garden Market Facebook page. As the farm has grown, Kerri Olson has taken on a bigger role in the local foods community. She has become certified in Farmers’ Market Food Safety: GAPs Pre-Harvest, GAPs Post-Harvest, Safety at the Market, and Value Added Products and she is the Saturday Market Manager at the Grinnell Farmer's Market. The Olson’s source their products to the Grinnell Farmer's Market, McNally’s Foods, Relish Restaurant, and New Pioneer Grocery Co-op. The farm also donates weekly to the MICA food pantry and assists the local third graders in planting their Giving Garden and donating plants to the other community Giving Gardens. The Olson’s are excited to begin working with Local Foods Connection (LFC). “LFC will allow us to give locally and also be sustainable in our business. We are excited to support LFC's service to farmers and families”.